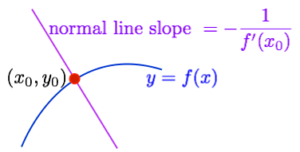 Are you working to find the equation of a tangent line (or normal line) in Calculus? Let’s solve some common problems step-by-step so you can learn to solve them routinely for yourself. These problems will always specify that you find the tangent or normal (= perpendicular) line at a particular point of a function. We’ll call that point $(x_0, y_0)$. 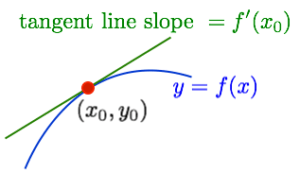 The problem statement typically specifies the point $(x_0, y_0)$, and so really these problems come down to determining the slope m of the line — which we’ll address below. You will use that equation again and again; memorize it if you don’t know it already. Very frequently in beginning Calculus you will be asked to find an equation for the line tangent to a curve at a particular point. We’re calling that point $(x_0, y_0)$. That is, find the derivative of the function $f'(x)$, and then evaluate it at $x = x_0$. That value, $f'(x_0),$ is the slope of the tangent line. If those equations look abstract to you, don’t worry. As soon as you work a few problems, the process will make sense — we promise. Sometimes instead a question will ask you instead to find the line normal to a curve. That’s the same thing as asking for the line that is perpendicular to the curve. We recommend not trying to memorize all of the formulas above. Instead, remember the Point-Slope form of a line, and then use what you know about the derivative telling you the slope of the tangent line at a given point. The problems below illustrate. Problem 1 illustrates the process of putting together different pieces of information to find the equation of a tangent line. Problem 2 requires that you find the pieces of information before you can put them together. For a particular function $g$, we know $g'(5) = 2$ and $g(5) = -3$. Write an equation for the line tangent to $g$ at $x = 5$. Since $g'(5) = 2$, we know that the slope of the tangent line at $x = 5$ is $m=2$. Furthermore, the tangent line contains the point (5, -3), since it passes through (grazes) that point on the curve. Either answer is valid and correct. Consider the curve given by $y = f(x) = x^3 – x + 5$. (a) Find the equation to the line tangent to the curve at the point (1, 5). (b) Find the equation of the line normal (perpendicular) to the curve at the point (1, 5). To write the equation of a line, we need its slope $m$ and a point $(x_o, y_o)$ on it. We already know a point, since the line intersects (grazes) the curve at (1, 5). What are your thoughts and questions? Does that provide the solution you were after? We hope so!